The book instructed us to feed our bees for the first few months to help them get established in their hive, so I've been dutifully mixing sugar with water and they've been lapping it up. Yesterday, I pulled the feeder out into the open (it usually sticks into the entrance) because it seemed to be leaking and I wanted to keep an eye on it. Now I'm not so sure about leakage --- even out in the open the bees consumed a couple of cups of sugar water yesterday. I notice that the workers who go out on forays beyond the feeder all seem to come back with full pollen sacs (like the one on the right), which I guess means the sugar water is fulfilling their other needs pretty well. That's the goal --- to give them a jump start as they build up their colony. I continue to be impressed by how tame our bees are --- I had the lens nearly touching the bee above when I took her picture and I sat a few inches from the hive for several minutes without wearing a veil, and in both cases no one bothered me. Such good little bees! I just wanted to tell you how much I enjoy reading all about your bees. 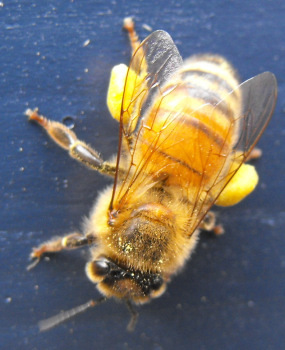 We have just recently begun keeping bees ourselves and all of your info is very helpful and interesting to me. Good luck to you both and take care. Thanks for commenting! I was hoping that I wasn't boring folks to tears with my bee posts. They're just so exciting and new! We're starting to feel like we know what we're doing, a year after getting started. I'll bet you'll feel the same soon too! 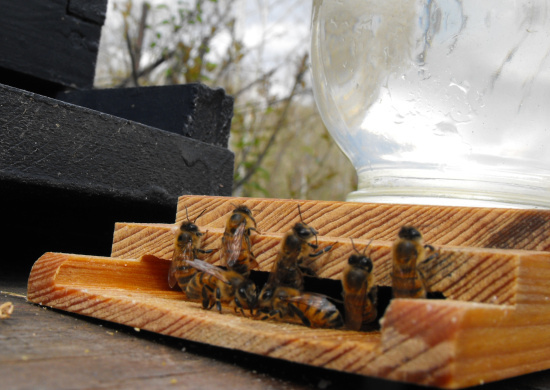 I'll be curious to hear how your top bar hives work. I might have gone that route if we hadn't gotten the traditional equipment free. Be sure to check back and tell me about it once you start your blog! I love reading blogs --- that's my morning "cup of coffee."